NEWLY-CROWNED WBO Oriental minimumweight champion Vic “Vicious” Saludar of Polomolok, South Cotabato was chosen as the “Boxer of the Month for October” by the Games and Amusements Board (GAB). GAB Chairman Abraham “Baham” Mitra also released yesterday a copy of the GAB Professional Boxing Monthly Ratings for October 2016. 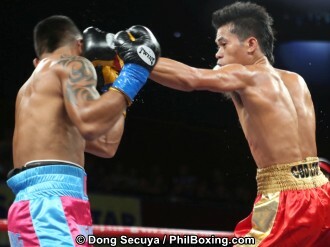 The 26-year old Saludar was chosen for winning the WBO Oriental minimumweight title against Jimboy Haya via a unanimous decision last October 28 at the Barangay Bulua Covered Court in Cagayan de Oro City. Judges Edward Ligas and Roel Dencing both scored 119-107 while Delbert Pelegrino saw it 118-108 all for Saludar. The no. 1 to contender is Robert Paradero, who recently captured the WBO Asia Pacific Youth minimumweight title by a UD against Ronie Tanallon also last October 28 in the undercard of the Saludar-Haya title-fight. The other current Philippine champions of the different divisions are light flyweight Lester Abutan of Manila, flyweight Felipe Cagobcob Jr of Manila., super flyweight Jonas Sultan of Cebu, bantamweight Glenn Suminguit of Manila, super bantamweight Jhonny Gemino of Batangas, featherweight Randy Braga of Manila, super featherweight Warren Mambuanag of Manila, lightweight Roberto Gonzales of Batangas and welterweight Dennis Padua. The super lightweight title is still vacant. Aside from Saludar, the other regional title-holders are his elder brother WBO Intercontinental flyweight champion Froilan Gallardo, WBC/EPBC minimumweight champion Toto Landero, WBC International light flyweight champion Jonathan Refugio, WBC Eurasia flyweight champion Michael Enriquez, OPBF flyweight champion Richard Claveras, OPBF super flyweight champion Rene Dacquel, IBF Pan Pacific super flyweight Aston Palicte, WBC Eurasia super flyweight champion Eranio Semillano, WBC International bantamweight champion Ernesto Saulong, WBO Asia Pacific bantamweight Arthur Villanueva, IBF Intercontinental super bantamweight champion Albert Pagara, WBC ABCPO super bantamweight champion Joemari Noynay, WBO Asia Pacific super bantamweight champion Juan Miguel Elorde, WBC International super bantamweight champion Richard Pumicpic, WBO International featherweight Mark Magsayo, WBO Asia Pacific super featherweight champion Juan Martin Elorde and OPBF super lightweight champion Al Rivera.